Thomas de la Rue was born in 1793 in Guernsey. He was a printer who had humble beginnings and founded the famous De La Rue Company which is considered to be the biggest papermaker and security printer in the world today. Thomas was born in La Foret in Guernsey and had trained at St Peter Port in 1803 with a master. He began business in collaboration with Tom Greenslade and they launched the paper Le Publiciste together. Soon after that, Thomas launched Le Miroire Politique, his own news paper publication. It was in 1816 that Thomas de la Rue went to London from Guernsey where he first started a straw hat making business. In 1830 he got together with William Rock and Samuel Cornish and started a business for enamellers, hot pressures and card making. His sons and his daughter along with his wife soon joined the family business. Thomas de la Rue was made the Chevalier in 1855 at the Legion d’Honneur. He retired in 1858 and handed over his business to his sons and died in London in 1866. De La Rue was the first company to introduce the art of letter press printing in the field of playing cards and was granted a patent in 1831. His first playing cards were made in the year 1832 and he soon employed Owen Jones. Other than being a famous playing cards manufacturer, De La Rue was also an important company in the field of Inland Revenue stamps, postage stamps and fiscal stamps for UK. Over the years the company began to be known as one of the best in engraving and miniature designs since several masters in the field had worked for him.Another major card manufacturing company in those years was the Charles Goodall & Co. which was taken over by De La Rue in 1922. The only competition of De La Rue then was the Waddington’s. During World War I, card games became greatly popular in UK and in other western countries which resulted into a huge demand for these cards. After the end of the war, the playing cards printing operation of De La Rue was done by Waddington’s, one of their largest competitors. In 1963, these two companies joined hands and together came to be known as The Amalgamated Playing Card Company. However, in 1969, De La Rue was sold to Waddington’s which has now become the leading producer of playing cards in the UK. The entire collection of cards manufactured by De La Rue was sold off in an auction organized by Sotheby’s in 1970. 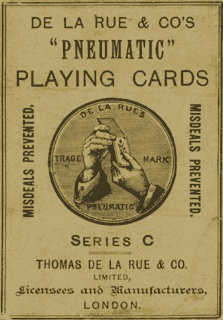 Over the years, various American and Belgian playing cards have been influenced by the cards manufactured by De La Rue. A standard double faced pack of De La Rue in the 1860s was known for its features like square corners and no indices. As an honor to Thomas De La Rue, the Guernsey Post Office had introduced two postage stamp sets of Thomas De La Rue in 1971 and then again in 1993 to commemorate his achievements over the years.